Login for member pricing. Patron or Premium Members: Free. Members: $95. Non-members: $950. Our most comprehensive report that encompasses the shooting sports industry into one, easy-to-reference resource. 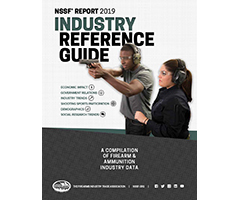 A timely and efficient source of information, it includes industry trends on hunting license sales, excise taxes, NICS, FFL dealers, manufacturing reports, economic data, demographics of shooting sports participants, equipment expenditures by segment, state-by-state participation and much more.